Installation is simple, create a FreeBSD (not 64-bit) VM with a 2GB HDD, 1 vCPU and 1GB of memory. 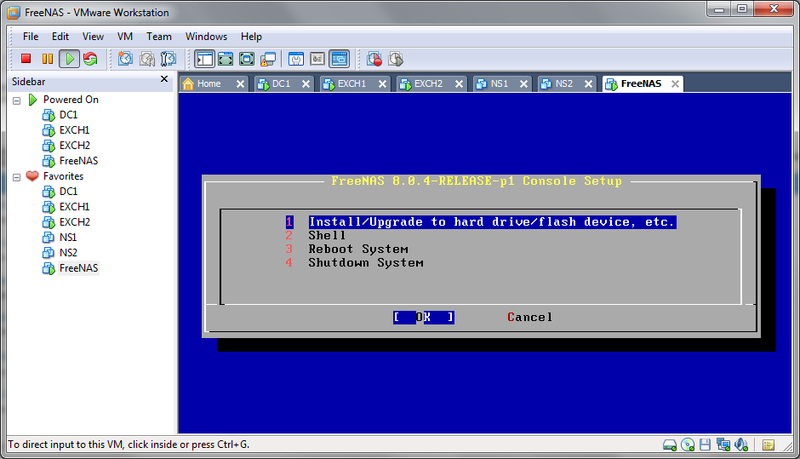 Download the ISO and boot from it – select option 1 to install FreeNAS to the local hard drive. Confirm the drive you wish to install to, and the prompt to erase all data on the drive. Now add your required storage to the FreeNAS VM, we’ll use this to configure the iSCSI drives which will be presented to the Windows 2008 R2 VM’s for clustering.